Magento is a very popular system for website creation in the world and has lots of advantages that promote this platform further. 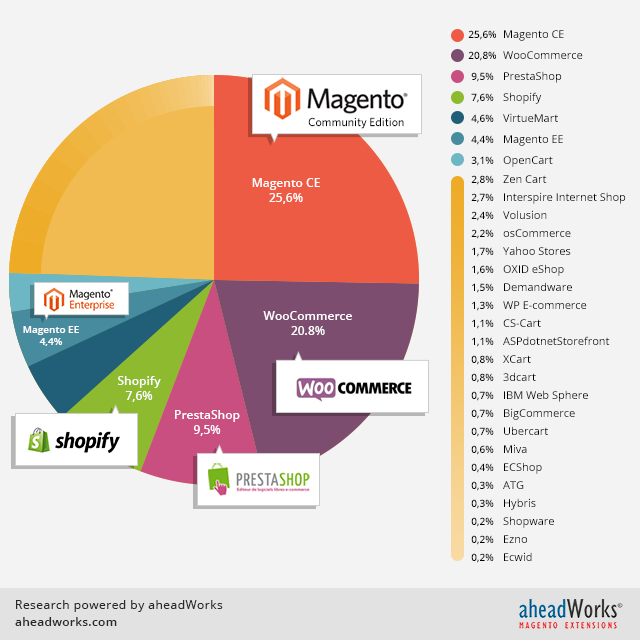 Such popularity of the eCommerce system gives us more free extensions that widen its functional, good and active community forums that helps you solve the problems avoiding the helpdesk system and many third party developers, that allows you implement the ideas about your online store on Magento system. The original of the picture is here. Why Product Printing business is so widespread? Let us take the most popular product in this area - t-shirt. Plain T-shirts are cheap, but designed t-shirts cost more and meet a ready market. So it is profitable to give your customers the ability to design t-shirts. The same situation with other products: hoodies, caps, business cards, wedding cards and etc. How to start selling online the products that you can be customized by clients. Print your customers ideas on your products. In short about E-Commerce Product Designer software. E-Commerce Product Designer tool is a completely independent solution from any eCommerce systems. Our Online Product Customizer is a separate tool that integrates with Magento using the extension-connector. Such simple structure allows you to store the Online Product Customizer tool files on the separate server as Magento needs lots of resources. That and its HTML5 basis provide your online store on Magento and the Product Designer software with fast speed in page loading. Customers love it, the same for search engines. Google also will give you the additional points in a page ranking thanks to your fast Product Designer tool. The Product Designer software has many standard features. You can read about it here. Remember that you do not need to buy the licence variant of the E-Commerce Product Designer software. You may test our extension on a subscription basis first. On the one hand, it will be cheaper for you, on the other hand, you will have a chance to estimate the changes in the sales on your website avoiding big sum spending. In addition, subscription is good because you always get the last updated version of Product Designer Software. If you are interested in this tool, please, contact us.